Scottish Power plans to expand its pumped storage Cruachan hydro electric power station in the Scottish Highlands, more than doubling its output from the current 440MW to 1040MW. The electricity and gas supplier will carry out a feasibility study before making a final decision on a scheme that would cost several hundred million pounds and create hundreds of jobs during construction. The Scottish Government backs the plans and had already included an expansion of pump storage infrastructure in its draft National Planning Framework. Scottish Power's Spanish parent company Iberdrola recently completed a seven year project to double capacity of a pumped storage scheme near Valencia - the Cortes La Muela - to 1500MW. 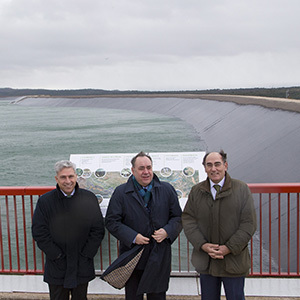 During a visit to La Muela Scottish First Minister Alex Salmond said: "The Scottish government recognises the potential for future development at Cruachan and other similar proposals for hydro-electric storage, to contribute to a balanced mix of energy generation across Scotland in the years ahead." This is the second recent announcement of plans to build additional pumped storage capacity in the Scottish Highlands, with electricity and gas supplier SSE having announced plans for an £800 million scheme at the Coire Glas hydro electricity scheme at Lochaber in December last year. The 600MW Coire Glas project, which could provide up to 10% of Scotland's estimated peak electricity demand, has been given backing by the Scottish government. It will use excess power from wind and wave farms to pump water to a reservoir which will be released to generate power at peak demand periods. Construction would take five to six years and will start in 2015 if SSE takes a final decision to invest this year.